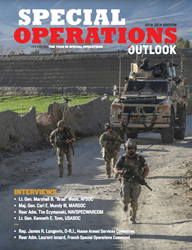 The 2018 edition of "Special Operations Outlook", provides an in-depth look at special operations forces (SOF) today, and includes stand-alone features on U.S. Special Operations Command (SOCOM) as well as each of its service component commands. Interviews with the commanders of Air Force Special Operations Command (AFSOC), Marine Corps Forces Special Operations Command (MARSOC), Naval Special Warfare Command (NAVSPECWARCOM), and United States Army Special Operations Command (USASOC), describe present day challenges and future initiatives. As always, there is a review of developments in international SOF as well. Highlighting international SOF is an interview with French special operations command’s leader Rear Adm. Laurent Isnard. From the legislative branch, Congressman James Langevin (D-RI), Ranking Member of the Emerging Threats and Capabilities Subcommittee, is asked to contribute his perspective on a number of SOF issues. Marking its 75th anniversary, this year’s edition has a special focus on the Office of Strategic Services (OSS), the precursor of today’s Central Intelligence Agency (CIA). OSS coverage includes a history of Maj. Gen. Donovan’s “PhDs that could win a bar fight,” as well as a look at today’s OSS Society, and how it serves the legacy of the OSS and educates the public on its importance yesterday, today, and into the future. Another historical feature details the 1918 Zeebrugge raid, which taught valuable lessons in what and what not to do in planning and executing a raid. The newest developments in SOF carbines, handguns, personal defense weapons, and suppressors are covered, as well as the story of one pack maker’s collaborative efforts with SOF. Features include Ambassador Geoffrey Pyatt’s views on State Department and DOD teamwork, and a description of a successful PSYOP on Joseph Kony’s Lord’s Resistance Army. "Special Operations Outlook" – previously titled "The Year in Special Operations" – will debut at the 2018 Special Operations Forces Industry Conference (SOFIC) May 21-24 in Tampa, Florida. Conference attendees should visit booth #1654 to pick up a free copy of the publication. OPEN THE DIGITAL EDITION. The online publication is best viewed on desktop, laptop, and tablet devices. The publication will be made available nationwide. Please contact your local bookstore and magazine retailer for more information. Faircount develops and publishes websites that showcase high-quality content in the defense sector.